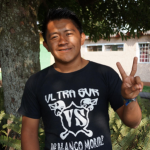 José, a teacher of primary education, is originally from Panajachel, department of Sololá. José was selected as a GOJoven Fellow when he was 20 years old. He is responsible, participatory, innovative, and eager to strengthen his leadership, in order to continue working with adolescents and young people from the educational center where he works.